Hearty vegan lentil soup, thick and tasty, scented with Pimentón (rich Spanish smoked paprika). Wash lentils in cold running water and place in a casserole. Add cold water and the rest of ingredients. Take it to a boil and let it simmer on low heat for 30-40 minutes, depending on lentils. While lentils are cooking make the sofrito: heat the 4 Tbsp oil in a shallow pan, add onion and cloves and cook until translucent. Add paprikas and quickly stir, on very low heat as it burns easily. Turn heat off and set aside. When lentils are cooked and tender but still firm, take onion and garlic head out and discard. Add paprika mixture to the casserole, mix thoroughly and let it cook 10 more minutes. Let it rest for 1 hour and when ready to serve sprinkle with chopped fresh parsley. 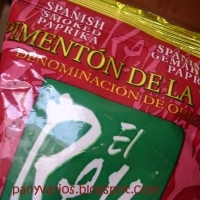 * Paprika, in Spain called Pimentón Dulce (sweet) or Pimentón Picante (hot), gives the dish its characteristic flavour and is well known as being the main ingredient, along with ground pork meat and other spices, of famous Spanish Chorizo. 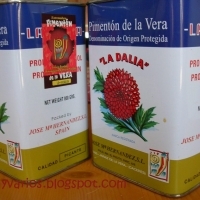 It is mainly produced in the province of Caceres, region of La Vera, in the mid-west side of Spain. 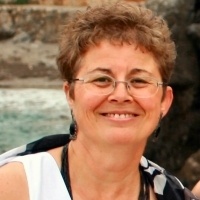 Hi Inma - this is Erin, krumkake's daughter! My mom and I were looking on here and I've been sucked into all of your great Spanish recipes. Especially this one! When I studied in Spain, my host mom would make delicious lentil soup for el almuerzo and then blend it and serve it again the next day for la cena. Yum! I will definitely be trying this! Thanks for all these great recipes! I adore lentil soup and this recipe looks unique. I am really excited to try it. Thanks for posting. Lentil soup is a favorite of mine. This sounds outstanding! 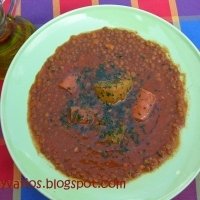 I love lentil soup, and I have made it several times, but not like this wonderful recipe! The sofrito sounds so good! Thanks for sharing. I love soups. Thanks for posting. Sounds delicious.